Wall Street veteran Tone Vays is a Bitcoin expert. Having been a trader at Bear Sterns and a VP at J.P. Morgan, he now focuses his time on promoting and educating audiences about the importance of Bitcoin. In this Q&A interview, Tone shares his thoughts on why he believes Bitcoin is a valuable asset which everyone should consider owning. What are your best arguments for why someone should consider owning Bitcoin? TV: My best arguments for the reason to own Bitcoin are for the first time in human history we can own something that is unconsfiscatable by another person or entity or organisation. Society has always gone after other people’s money, but with Bitcoin you can own it in your head and the best thing you can do is not tell anyone you have it, and you then have something of value that is simply unconfiscatable. The second reason is that you now have the ability to send any amount of value in a permissionless way. The idea that no-one can stop you from sending a financial transaction and perhaps in the future, any kind of a digital transaction of value, is so new that people aren’t even aware of what it actually means to be able to send digital value in a censorship resistant way. But these are the properties that give Bitcoin its value more so than just a medium of exchange. What is meant by Bitcoin being censorship resistant? TV: Right now every single payment that you make to another person goes through an intermediary; either PayPal or a bank or Mastercard, and more importantly the governmental jurisdiction decides if you’re allowed to make that payment. The payment could be stopped halfway through, and then you have to try and get your money back. With Bitcoin no one can stop it. The moment you decide to send another person digital value, you can just send it and there’s nobody in your way. There is no one that has to give you permission to pay another person money, and all they need is an internet connection. And in the future they may not even need that because there will be satellites on their own network that will allow you to make Bitcoin transactions. What gives Bitcoin its intrinsic value? TV: I believe that Bitcoin has multiple levels of intrinsic value. The properties like censorship resistant value transfer that no one can stop you from sending. But more importantly what gives it intrinsic value is the productive capacity and the brainpower of some of the brightest developers in the world that have chosen to work on this open source protocol. There’s over a hundred developers and they’re all trying to make Bitcoin better. Everything is triple checked so that Bitcoin doesn’t go down, and this productive capacity of some of the brightest minds that are building the platform is what separates Bitcoin from any other altcoin. Altcoins may have a few, maybe one to three smart developers, but Bitcoin has hundreds of developers. It’s completely head and shoulders above the rest and because the stakes are so much higher in Bitcoin, changes take a lot longer but they’re a lot more secure and they’re a lot safer and that’s what truly gives it the value. If Bitcoin’s Blockchain is the new revolution in technology like the internet was, then in the future everybody will just peg to it, and they’ll slowly forget about the alternatives. Why do you think there’s so much confusion about Bitcoin? TV: The biggest reason why there’s so much confusion is because Bitcoin is not a company. It doesn’t have a CEO and it doesn’t have a PR department. All it has are passionate people trying to promote Bitcoin and what it stands for. There’s no-one in control of the brand, anyone can just copy the code and make their own version. Then they can use the money raised in their ICO to start a media campaign telling everybody how their token is better than Bitcoin. And it’s hard for people in Bitcoin because they’re trying to focus on making the technology better and not out there all day defending Bitcoin from those that are spreading lies about it to sell their own token for their own personal greed. This creates a lot of confusion and it makes it challenging but at the end of the day the best technology will make it to the top. I believe Bitcoin will win out in the end. Part two of this interview with Tone Vays is here. 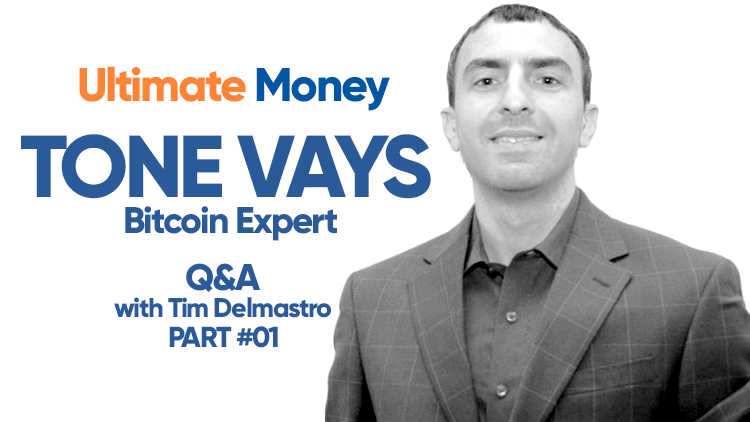 Tim Delmastro is a multi-award winning filmmaker and journalist, having researched and documented subjects relating to Bitcoin and other current events in finance for over a decade. His films have been broadcast on Netflix, The History Channel, Al Jazeera, SBS Australia and Emirates In Flight. Tim has been a featured guest on Fox News, RT, The Project and several radio stations and podcasts.